My roma tomatoes are in trouble. They get almost all the way ripe and then they look like something (or someone) took a big bite out of them, only there are no bite marks and the hole is all crusted over. Everything I have found online suggests either “catfacing” or “blossom end rot”. Catfacing is caused by a variety of things: insect damage, bad pollination, or environmental factors. I’m not sure why it is called catfacing. It is more a scarred hole than a cat’s face. It only appears (at least on my romas) at the bottom end. From researching different gardening forums and sites, the fruit is only inedible if the scarring and puckering is deep. But, I’m not sure I want to eat a tomato that looks like mine do. So what caused it? The most common cause is exposure to temperatures below 50 degrees during flowering and fruiting, but it’s been so hot that I don’t think that would be it. The low temperatures inhibit pollination causing the blossom to stick to the fruit, keeping it from developing into a juicy, sweet and yummy tomato. So when the fruit starts to expand, the scarring gets worse. Since my tomatoes developed during warm weather, I don’t think this is the problem. Catfacing can also develop if there is excess nitrogen in the soil or exposure to pesticide…neither of these apply to my poor little romas. We do not use pesticides and we fertilize with nitrogen sparingly. On rare occasions, catfacing can be caused by too much water. It has been either pouring or sweltering so I suppose that could be it. Now, what’s the cure? Romas along with many heirlooms are more susceptible to catfacing, so some sites have said to simply plant more resistant varieties. Gee, that’s very helpful…for next year. A couple of sites also suggested to wait until day and evening temperatures are consistently warm. Again, no help for this year if catfacing is my problem. All of the sites said that catfaced tomatoes are safe to eat if you simply cut the scarred area away so I suppose if it is catfacing, I could still get something out of my plants. It could also be blossom end rot. 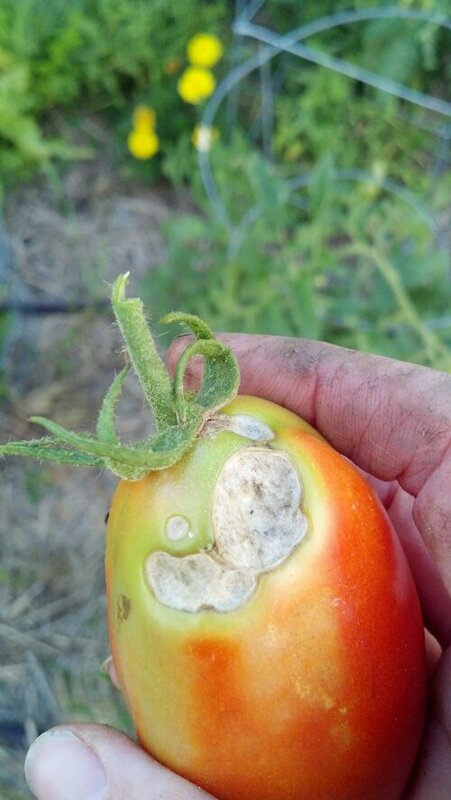 This is a disease tomatoes can contract at any stage in development but most commonly appears when the fruit is 1/3-1/2 of full size and the ick appears on the bottom end of the fruit. Hmmm…that sounds like my tomatoes. The good news is that this disease does not spread from plant to plant. The bad is that fungicides and insecticides are no help in controlling this problem…which is really good news for us because we do not use either. Causes could be environmental issues that affect the water and calcium supply in development, especially if the plants are exposed to a sudden drought (not likely because we water when there is no rain). Or…cultivating too close to the plant, destroying roots and the chance for the plant to take up the water and minerals it needs. This isn’t it because we planted everything at once and have not moved any plants. It could be too much salt which decreases the availability of calcium in the soil, but I consistently fertilize with crushed or powdered egg shells which are full of calcium so I doubt that is the cause. To control blossom end rot, the plants need moisture and calcium in consistent supply (they get both). They should be planted in well drained, warm and nitrogen rich soil. Great, another solve that is only helpful for next year. Luckily, the other varieties that I planted are doing well. The cherry tomatoes are sweet and juicy and the prince tomatoes are beautiful and delicious. We haven’t harvested a tomatillo yet or any of the other heirlooms, but I expect those to be scrumptious as well. As for the romas, better luck next year I guess.